There are a number of drilling machines and they are all different in one way or the other. The major differences can be in style, design, material used for their manufacture, brand and appearance. The drilling machine one uses should be suitable for the job he/she does. Till a few years ago, only wired drills were available to drill holes on wood but now there are cordless drilling machines which make drilling job easier and more convenient. Among the cordless drilling machines, Makita LCT300W cordless drill is the most popular one. It is designed in such a way that it becomes very easy to work with. It can also work nonstop for very long periods. It is a very simple machine so that even unskilled people can use it for drilling jobs. You don’t have to exert force on the machine to drill because the machine is powerful enough to drill through any hard wood. The way the drill bit rotates makes it possible to make holes on wood with the minimum effort. Since the LCT300W cordless drills don’t use wires to connect them to electric power points, you have full freedom of movement. Wired drills limit your movements while you work. You also need to find a convenient place to plug in your wired drill. With a cordless drill, you can work anywhere, even at places where there is no power supply. Compared to other drills, Makita LCT300W cordless drill is lightweight and ergonomic. In many ways, a Makita LCT300W model cordless drill is different from other drills. Its body is sleek and slightly angled so that it is very easy to hold in your hand and to work with. The rubber covered handle offers a firm grip and there is no chance of slipping. Compared to other drills, it is very light and so there is no strain on your muscles. The peculiar design of its body makes it possible even to drill holes at places which are difficult to reach with other drills. Though the drill is lightweight and small in size, it is powerful enough to drill on any hard wood. Drilling with this cordless drill is a pleasant experience. An additional feature of Makita cordless drill is its locking system. Even while working with it, we can shift the operation mode either to drilling or to driving. Since the operation mode is locked, there is no chance of accidently changing one mode to another. 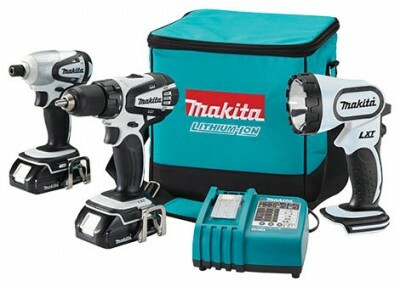 When you buy a Makita LCT300W cordless drill, you get some accessories too along with it. There are two more batteries which you can use as back up if you need to work for long hours. There are some brushes also which are meant to clean the machine. The drill, while drilling holes on wood, collects dust and dirt and it is important to clean the drill from time to time. The LCT300W drill needs 18 volts to function and this power is supplied by the attached batteries. The drill is therefore power efficient and easy to use. Are you keen to get a Makita cordless drill for your DIY work at home? If you are, click on the link below to get one from Amazon.com and have it delivered to your doorstep. ==> Click here to buy Makita LCT300W from Amazon.com! A few items necessary for home improvement tasks may include items like paint rollers, edges, sponges, sander/sandpaper and a putty knife. The fact is that the home improvements may generally need only a few specific tools, which can also be used for multiple tasks. Larger tools and equipment can be taken on rent for short term projects. If there is an idea for lawn maintenance and landscape renovation along with the home improvement projects, it is ideal to acquire a good rake, wheelbarrow and similar items with the tools. For improvement of outdoor property, the house owners can go ahead with buying specific tools and enjoy the outdoor work, without the need for extraneous expenses. In any case, addition of the basic tools in your tool kit will help you in a great way that would simplify your indoor and outdoor tasks considerably.